Here's where to watch every episode of The Fugitive season 4. Mouseover or tap an episode to see where to stream it. Click or tap the play icon to stream it on the best available service. The Last Oasis Sep 13, 1966 Injuring after being shot during a police chase, Kimble seeks refuge at an orphange near a Navajo Indian reservation in Puma County, Arizona. Annie Johnson, the head teacher (and herself an orphan), removes the bullet and offers Kimble work as a teacher. Meanwhile, while the local sheriff Prycer belives that Kimble has escaped, a determined and overzealous deputy, named Steel, belives Kimble is still in the area and suspects Annie of sheltering the fugitive. Death is the Door Prize Sep 20, 1966 Kimble visits an enclosed plaza in the heart of the city. Due to a misunderstanding, on-site security mistakes him for someone else and gives chase. Thinking they are on to him, Richard tries to jump a fence but is caught by a guard, and has to punch him out to get away. A lady working at a camera store lets him stay at her place (in the plaza), while he rests and heals. To complicate things more, Kimble's earlier visit to the video store was caught on video tape, and someone who sees the tape recognizes him. Kimble's visit also coincides with an accidental shooting inside of a storage room, so the police are at the plaza, investigating. A Clean and Quiet Town Sep 27, 1966 Kimble makes the mistake of going to Clark City, a corrupt gambling town. Fred Johnson (the one-armed man) is there as well, and has two corrupt cops beat up Kimble. When Richard survives the attack, Johnson then puts out a contract on him. Kimble eventually catches up with Johnson, beats the garbage out of him, and tries to turn him over to the police-who are working for a local mob figure. The small-town syndicate has to decide what to do with both troublemakers: dispose of them, or let them go? Ten Thousand Pieces of Silver Oct 11, 1966 Kimble finds work on Jake Lawrence's farm, where he develops a special friendship with Jake's autistic daughter, Cathy. But Kimble soon becomes nervous when the local sheriff, Mel Bailey, begins searching for Joe Burmas, a convicted murder having escaped from prison a few weeks before. Burmas attacks and nearly kills Kimble after trapping him inside a truck that crashes into a creek. Meanwhile, back in Stafford, Gerard has the local newspaper establish a $10,000 reward for Kimble's capture hoping someone will respond. A local storekeeper recognizes Kimble's face in the newspaper but decides to collect the money for himself. Kimble then tries to evade capture from a local posse, but he again runs into the murderous Burmas whom also takes Cathy hostage as well. Joshua's Kingdom Oct 18, 1966 While working as a veterinarian assistant in a rural town in Utah, Kimble becomes aquainted with Ruth Simmons, an unwed teenage mother whom has a sickly infant. But her father, Joshua, is a Christian Scientist whose religion prohibits the use of medicine for any ailment. Kimble brings over antibiotics, but Joshua destroys the drugs. After determing that the baby is anemic, Kimble secretly arranges for a blood transfusion. Meanwhile, after stumbling upon Kimble's true idenity, a would-be deputy, named Pete, searches for the fugivtive with the aid of his two bloodhound dogs. Second Sight Oct 25, 1966 While working in a film supply store as a photo developer, Kimble spots Fred Johnson, the one-armed man, in a photo. After tracking down the freelance photographer, Howie Keever, whom took the photo, Kimble learns that Johnson works at a nearby chemical warehouse. Kimble goes to the warehouse and suprises Johnson. During the scuffle, Johnson accidently ignites some chemicals, chreating an expostion which leaves him badly injured and Kimble blinded by the flash. Johnson manages to escape and once again reports Kimble to the police. Kimble manages to escape from the hospital before the police arrive and tries to get back to Howie's apartment to ask him to hide him. But the police question Howie and his uncle whom learn Kimble's true idenity, as well as the $10,000 reward. Wine is a Traitor Nov 1, 1966 Carl Crandall is the wealthy and spoiled son of winery owner Pete Crandall. Carl stops a labor strike at the winery by killing the union leader and framing Morales, another worker, for it. Kimble happens by and witness Carl run from the scene of the crime, but he is unable to tell anyone because of his secret. Kimble tries to write an annoymous letter to the California District Attorney, but Carl's goons confiscate the letter. While Kimble tries to persuade Morales's wife, Elena, to help him report Carl to clear her husband, Pete suspects Carl of the murder and sends his two right hand men to keep an eye on Carl. But the two men are in league with Carl who orders them to murder Kimble. Approach with Care Nov 15, 1966 Kimble meets Willie Turner, a mentaly retarded young man who is accused of hurting a child. Kimble reluctantly hides Willie at a carnival where Kimble now works. Kimble tries to persuade Willie to return to the hospital where his sister had him committed. But naturally, Willie is slow to understand what Kimble means and, on top of that, does not remember hitting the young boy he is accused of hurting. Willie's sister, Mary, as well as an attendant from the psycho ward at the local hospital, arrive searching for Willie and find him. But the attendant recognizes Kimble and calls the police. In trying to protect his new friend, Willie strikes the attendant, badly injuring him, and warns Kimble in which both men, now fugitives, take off in a stolen truck. Kimble hides out with Willie at a nearby auto wrecking lot, where he tries to persuade Willie to return to the hospital, while the sheriff and his men already on their trail. Nobody Loses All the Time Nov 22, 1966 After Kimble spots Fred Johnson at the scene of a fire, he gives chase-but stops to help a woman who has been hit by a vehicle. After Kimble helps her get to a hospital, he discovers that she is Johnson's girlfriend. Meanwhile, Johnson has contacted her and told her to contact the police. Eventually, Gerard arrives at the hospital, as a result of a tipoff, and tries to lay a trap for Kimble. Right in the Middle of the Season Nov 29, 1966 While working as a fishing crewman, Kimble becomes embroiled in a union strike which is orgainzed by Joe Donovan, the son of Kimble's employer, grizzled fisherman Tony Donovan. During a rally, Kimble, Tony and a few others are arrested. After being released, Kimble tries to leave town knowing his secret will be revealed, but he's prevented from doing so. When the police finally learn Kimble's idenity, they question Tony about his whereabouts, but the sympathic Tony claims not to know. He then offers to take Kimble to Mexico if he helps him out on his latest fishing trip. But Joe sees Tony smuggle Kimble on his boat and calls the authorities. The Devil's Disciples Dec 6, 1966 While fleeing from a sheriff's dragnet, Kimble is rescued by a dangerous motorcycle gang called 'the Devil's Disciples, led by the brutal Hutch. As payback, Hutch and his gang want Kimble to help them avenge the death of a former gang member who robbed a gas filling station, where his father turned him in and as part of his sentence; he was drafted and sent to Vietnam where he was killed in action. When Kimble notices that the gang is not completly unified, he seeks help from Don, one of the members, and his girlfriend, Patty, to help him escape so he can warn the police to prevent the killing of the deseased gang member's father. The Blessings of Liberty Dec 20, 1966 Kimble finds work at an upholstery store where the police are staking out the place in their search for an escaped killer, named Bowen. Kimble becomes aquainted with one worker, a Hungarian immigrant named Josef Karac, whom Kimble discovers that Josef is a doctor wanted by the police for an abortion that he performed years earlier. Meanwhile, the police stake out Dr. Karac's apartment where his wife, daughter and nephew live, while undercover cop, Jim Macklin, goes undercover as a worker at the shop where Bowen was last seen to investigate his girlfrend whom is Dr. Karac's daughter. 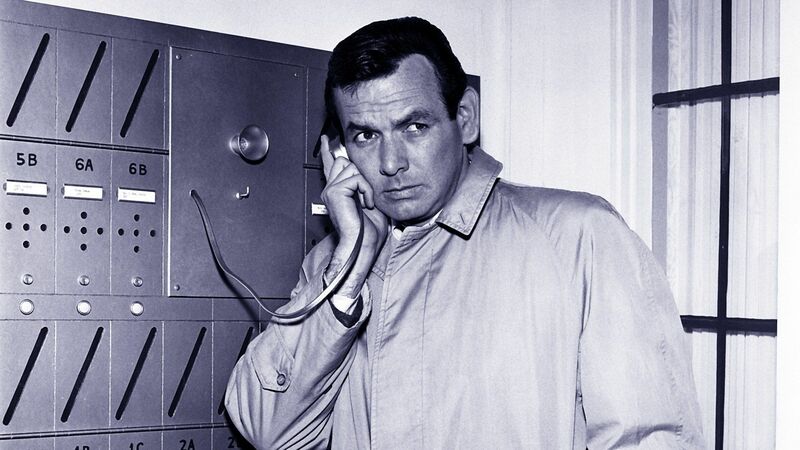 But Macklin soon recongizes Kimble and begins a second investigation to try to capture him. In the meantime, Bowen returns and takes the Karac family hostage to force them to hide him from the police just next door. The Evil Men Do Dec 27, 1966 After Kimble saves his boss' life, the man (a former mobster), is determined to repay the debt to Kimble by killing Gerard. After he learns that Gerard has discovered Kimble's whereabouts, he leads the Lieutenant into a deadly trap. Can Kimble save Gerard in time? Run the Man Down Jan 3, 1967 While hopping a freight train, Kimble meets a wounded criminal who demands to take him to a rendezvous point in the hills of Southern California. Kimble reluctantly does which is an isolated cabin in the deep woods where they are joined by three more men whom happen to be robbers of an armored car who demand from the criminal their loot. Not believing their accomplice's true story that he lost the money when it fell off the train due to his gunshot injury, the three robbers hold Kimble, a widow named Laura Craig, as well as a park ranger who happens by, while torturing the man for the location of the money. The Other Side of the Coin Jan 10, 1967 While working as a clerk in a small grocery store in Ocean Grove, California, Kimble becomes embroiled in a conflict between his co-worker Larry Corby and his father Ben, who's the town sheriff. When Ben refuses to support Larry and his pregnant girlfriend, the boy dons a mask and robs the store. After being shot during the escape, Larry drives off while Ben gives chase. Larry runs off the road and Ben is shocked to find his son as the holdup man. Ben then hides Larry and after recognizing Kimble, makes a bargain: if Kimble can save his son's life, Ben will set him free. The One That Got Away Jan 17, 1967 Ralph Schuyler is a government agent who goes undercover as a boat captain to spy on Felice Greer, the wife of an international embezzler hiding out in Mexico and she's presumably coming down to him with the stolen money. Kimble happens to be on the boat too as a hired deck hand. When Ralph learns that Kimble's identity is false, he takes Kimble's fingerprints and after an 'emergency' landing, the agent leaves the fingerprints with a local Mexican shopkeeper and notifies the authorities of Felice's whereabouts. But when Ralph is badly burned in a engine room fire, Kimble tries to save him and takes over the boat's steering to safely make it to their destination. But when Kimble intercepts a cable with the incriminating report on his fingerprints, Kimble is torn between fleeing or staying to help Ralph, while Kimble also discovers that Felice's husband is up to no good concerning the stolen money. Concrete Evidence Jan 24, 1967 Kimble finds work as a construction worker in Nebraska where he is recongized by building contract; the unscrupulous Alex ""Pat"" Patton, who once built a theater in his home town. But a wall of the theater collapsed due to faulty construction which killed three children. Although exonerated of manslaughter charges, the townspeople have been irate to him ever since. Now two years later, Pat's company faces financial ruin, yet Pat pours his own money into a mysterious ""motel"" his crew is now building. Pat approaches Kimble and tells him that he knows who he is from a wanted poster he keeps in his office. He tells Kimble about his plight and that he has one month to live because he's dying from a heart condition. Pat wants Kimble to keep him alive long enough to finish the ""motel"" and if Kimble refuses to do so or flees, Pat will turn him in to the local authorities. The Breaking of the Habit Jan 31, 1967 After fleeing a police roadblock where he gets shot in the leg, Kimble hops on a truck headed toward Sacramento where he meets Sister Veronica (the nun whom he drove from Nevada to Sacramento in the 'Angels Travel on Lonely Roads' episodes) whom is now the principal of the St. Mary Magdalene School for girls. Kimble asks Sister Veronica to drive him to Tarlton, where the one-armed man supposedly works as a numbers runner for a local racketeer. But a 'bad-girl' student recognizes Kimble and calls the police, forcing Kimble to hide on the roof of a building despite his injury. Meanwhile, Sister Veronica (whom is suffering from a brain tumor) learns that another delinquent student has run away, and is torn between driving after the girl or staying to help Kimble. There Goes the Ballgame Feb 7, 1967 While attending a minor league baseball game, Kimble unwittingly witnesses a man walk away with a woman whom is later revealed to be the daughter of newspaper publisher Andy Newark. After discovering that Kimble witnessed the proceedings, Newmark summons Kimble to his office where he tells him that the woman is his daughter and she has been kidnapped. Her abductors want a $200,000 ransom. When word leaks out, reporters surround the Newmark household and Kimble is unable to slip away. Meanwhile, the kidnappers, a former baseball player and a friend, realize that Kimble witnessed them. So, they plot to have Kimble deliver the ransom money so they can kill him. The Ivy Maze Feb 21, 1967 Fritz Simmons is a college professor doing research on sleep depervation. One of his patients is the one-armed man Fred Johnson, whom works as a groundskeeper at Wellington College. When Johnson begins talking in his sleep about having killed a woman, Fritz contacts Kimble. When Kimble arrives, he verifies that it is indeed Johnson, and he and Fritz realize that by recording Johnson's confession will prove Kimble's innocence. Meanwhile, Gerard has found out about the experiments from Fritz's wife Caroline, and believes that Kimble may be on the premises. Gerard's arrival at the facility leads to an incredible confrontation between himself, Kimble and the one-armed man. Goodbye My Love Feb 28, 1967 Kimble becomes romantically involved with former recording star Gail Martin, unaware that she know his secret, and the $10,000 reward for his capture. Gail and her other lover, Alan Bartlet, are plotting to kill Alan's wealthy wife Norma, a former golf pro now confided to a wheelchair, and put the blame on Kimble so they can capture him and collect the reward money, and Norma's vast wealth. Passage to Helena Mar 7, 1967 After being arrested in a small Montana town for a minor loitering charge, Kimble is put in jail next to a suspect in a race-related killing. A determined black deputy becomes determined to transport Kimble and the racist murderer to the state capital for arraignment. But their journey is filled with adventure and danger when they are ambushed by the killer's accomplices and are now forced to travel on foot through hostile territory. The Savage Street Mar 14, 1967 Kimble is working at a cigar-making store owned by Jose Anza, and becomes close friends with his son Jimmy. Jimmy is caught between the expectations of his demanding father who wants him to play the violin and the harassment Jimmy receives from three street punks. When Kimble is shot in the leg after the police discover him, Jimmy hides the fugitive from both his father, and his uncle Miguel, a police officer determined to capture the fugitive. Death of a Very Small Killer Mar 21, 1967 Fleeing to Mexico, Kimble somehow contracts pnenmonia and seeks refuge at a local hospital where he is recognized by Dr. Howell, an ambitious American doctor whom is conducting reseach on menigitis. After Kimble recovers, Dr. Howell blackmails him into assisting with his research in exchange for protection from the local state police. While working with Howell's assistant, the attractive Reina Morales, Kimble soon discovers that several of the patients are being unwittingly infected and sacrificed for Howell's research purposes. Meanwhile, a persistent police sergeant, named Rodriguez, begins investigating Kimble's true idenity. The Walls of Night Apr 4, 1967 Kimble, working as a truck driver out of Portland, Oregon, becomes romantically involved with the radio dispatcher Barbara Wells, unaware that she is a convicted embezzler on loan through the state prison's work-release program. Distraught after her parole is denied for another six months, Barbara flees to Seattle where Kimble is staying and asks to take her to Canada with him. But when Kimble learns the truth, he decides to take her back to Seattle. Meanwhile, Barbara's parole officer, Art Meredith, soon stumbles upon Kimble's true idenity and decides to set a trap for him to bring both Kimble and Barbara back to Portland. The Shattered Silence Apr 11, 1967 In the hills of Oregon, a young sculptor, named Andrea, hides Kimble from a local deputy, named Howe. But when the lawman finds him, Kimble retreats deeper into the mountains where he finds refuge in the home of John Mallory, a former scholar who cut himself off from civilization 14 years earlier and his only companions are two vicious German Shepherd dogs. Despite being aware that Kimble is a fugitive from the law, Mallory takes a liking to Kimble and forbids him to leave. Kimble is compelled to help the ailing Mallory as Deputy Howe closes in on their location. The Judgment (1) Aug 22, 1967 This was the series finale. In the first part, the one-armed man whom Kimble has been pursuing has been arrested for a minor crime. Lt. Gerard tries to use this to lure Kimble out into the open. A woman who knows Kimble tries to help him. Kimble tries to see if this man is the one he is looking for but someone wires a bail bondsman some money to bail him out. KImble then visits the bail bondsman but finds him dead. He then goes through his papers and is shocked to see who sent the money. He then goes to see this person but Gerard catches and takes him in. As the one-armed man hops on a train, Kimble and Gerard are making their way back.